Cases under review by the Ombudsman for Defence Forces rose 15% in 2015. THE NUMBER OF cases under review by the Ombudsman for the Defence Forces continues to rise, even though the actual number of complaints is beginning to fall. The annual report for 2015 from the Ombudsman shows that the 132 cases under review during the last year represented a 15% increase on the 115 cases under review in 2014, and was 32% higher than the 100 cases in 2013. Ombudsman Patrick Anthony McCourt said that current delays in case reviews were “unacceptable” and that resolutions could be proposed on an informal level at an earlier stage. The 111 complaints received last year may be lower than the high of 127 in 2012, but it is still significantly higher than the 62 complaints reported in 2010. The most common cause of complaint – at 56, it was reported in half of cases – related to not being selected for a promotion. In one case, McCourt found that one promotion had not been made due to an administrative error and suggested that the complainant be promoted “without delay”. Another common cause of complaints was general maladministration, with 47 reported on that issue. Another 17 complaints were made related to not being selected for overseas service or a particular posting, 8 were made due to non-selection for a career course and 4 were related to interpersonal issues. The Eastern Brigade accounted for just over a quarter (26.5%) of complaints, followed by the Air Corps (24%) and the Southern Brigade (19%). The fewest complaints (7%) were reported at Defence Forces HQ with nine in total. In a statement, McCourt agreed that the current levels of cases under review was not acceptable and, if changes were not made, the number would continue to rise. He said: “I am strongly of the opinion that the present system includes delays which are unacceptable and that a coordinated effort to reduce those delays is necessary. “I am also of the opinion that a significant reduction in the extent of the current reliance on lengthy formal reports by my Office, to conclude consideration of complaints referred to me, is both necessary and achievable, if the current delays in the system are to be reduced. Such changes may require amendment to the legislative and regulatory framework. 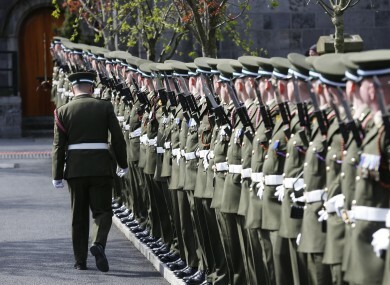 Email “Not getting a promotion was the most common complaint in the Defence Forces last year”. Feedback on “Not getting a promotion was the most common complaint in the Defence Forces last year”.